Earlier today, Apple launched their much anticipated Apple Music streaming service. 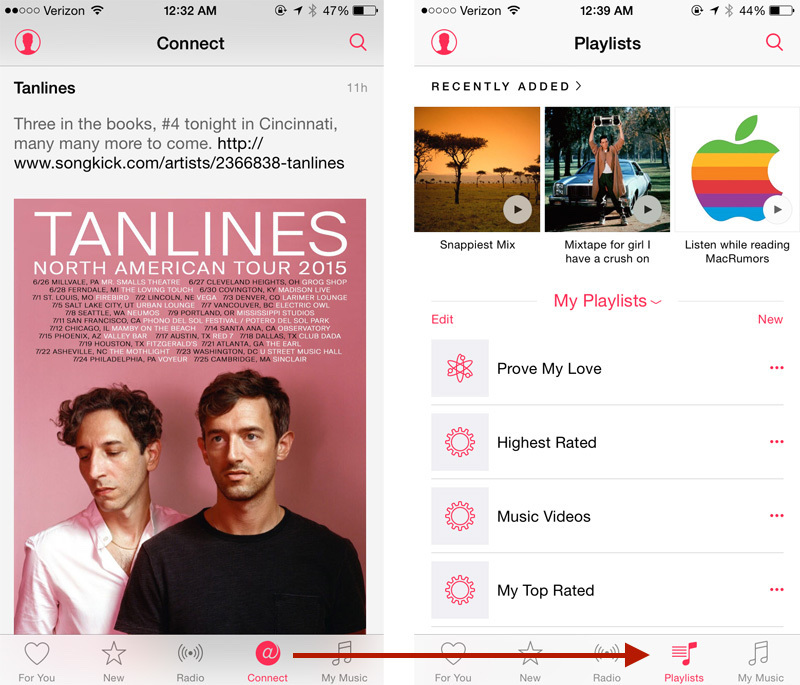 The iPhone app includes dedicated tabs called "For You", "New", "Radio", "Connect", and "My Music". The first two tabs offer areas for music discovery, while "Radio" provides themed stations as well as Apple's own Beats 1 Radio. Meanwhile, the last tab, "My Music" provides you with access to the rest of your existing music catalog as well as any new songs you might add from Apple Music. The "Connect" tab, however, is a new service from Apple which is described as a place where "musicians give their fans a closer look at their work, their inspirations, and their world." Similar to a social network, it allows users to "follow" their favorite artists and see additional content. If "Connect" doesn't interest you, MacRumors reader Eric points out a handy tip to replace the "Connect" tab with a dedicated "Playlists" tab which he describes as "much more useful". Under Settings -> General -> Restrictions, Apple allows you to disable "Apple Music Connect" which removes the Connect tab and provides the alternate Playlist functionality. Earlier today, Apple launched their much anticipated Apple Music ('https://www.macrumors.com/2015/06/30/apple-releases-ios-8-4-with-apple-music/') streaming service. The iPhone app includes dedicated tabs called "For You", "New", "Radio", "Connect", and "My Music". The first two tabs offer areas for music discovery, while "Radio" provides themed stations as well as Apple's own Beats 1 Radio. Meanwhile, the last tab, "My Music" provides you with access to the rest of your existing music catalog as well as any new songs you might add from Apple Music. Any way to get the SONGS tab back? Connect seems much more artist friendly than Ping. My band is on iTunes and we make over $1,000 a month from downloads. But we were not deemed fit to join Ping as an artist. To me that was the main reason Ping failed. Social media is about turning your friends on to new music, pictures, videos etc. When your only artists are Lady Gaga and Elton John no one is excited to share them. Your friends already know about those artists. With Connect, my band was approved today as a verified artist. And if that Trent Reznor video is honest, it looks like any band on iTunes, no matter how small, can become verified. That gives me some hope that Connect will take off and actually work as a way for artists to give (and sell) new content directly to fans. Perhaps using it as a chat box will be something we can do to promote our Connect page. My hopes are up. Don't disable it so fast! I'm not getting how people are not interested in Connect... do you have a favorite artist or band that you really love to listen to and flow? If so, what if they are putting up previously unreleased tracks for free on Connect, or behind the scenes rehearsal videos, wouldn't that be of interest to you? That's what Connect is all about. All of my music projects from my record label have been approved for Connect and I've started to post previously unreleased songs, photo sessions and a short analog synth test video. I think Connect is going to be the thing that really changes the music world for indie artists... as long as people "get" it. Some people just want the music app to listen to music. I'm pissed they took away the option to customize the menu at the bottom of the screen. I would be ok with keeping Connect if I could click the "more" button to get to it. Just let me have Artists, Songs, Playlists, and More to get to all the streaming junk. I really hate how Apple doesn't want us to have our own music any more. Of course the same thing happened with the AppleTV a while ago. Between this and Aperture, I'm finally looking at moving my content away from Apple apps. Just need to figure out how to get my music database (playlists/ratings/song count) into Synology Audio Station. Most of my favorite artists are dead. I know new info can be posted by the people that maintain that station but I'm not that interested actually. I don't do artist adoration, I'm just a music addict who listens a lot (really a lot). Works in iTunes too: Settings > Parental > Disable > ☑ Apple Music Connect. Does anyone know whether Connect is the only feature that is related to 'following' artists? Or are these used for something else too? I don't follow any artist on Twitter, Youtube, Facebook, Instagram or Soundcloud, I highly doubt I will start to do so now on Connect. Is 'Connect' just 'Ping' reborn? I seem to remember it doing the same thing. ..
Not joining Apple Music gets rid of the For You and New and by disabling the Connect per this article leaves me with the My Music, Playlists, and Radio tabs.